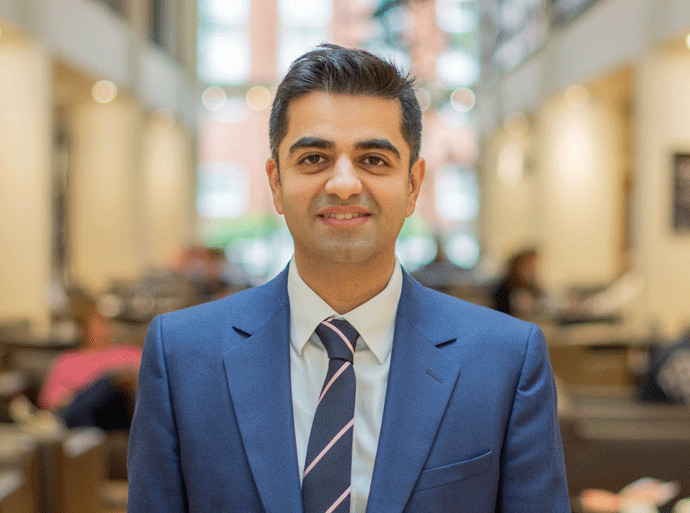 Dr Neil Ruparelia was awarded his medical degree from University College London in 2004 and an intercalated degree (BSc) in Medical Law receiving numerous prizes. He completed specialist training in cardiology in Oxford with specialist interventional fellowships at the Hammersmith Hospital, London and a year in Milan, Italy at the world-famous San Raffaele Scientific Institute during which time he was awarded a MSc in interventional cardiology. He was awarded a DPhil (PhD) from Balliol College, University of Oxford funded by a British Heart Foundation Clinical Research Fellowship. During this time, he was also the recipient of a British Heart Foundation travel fellowship to the Broad Institute (MIT) and Harvard Medical School (Boston, USA). He was the winner of numerous prizes including President's Gold Medical in Cardiology from the Royal Society of Medicine and investigator prizes from the European Society of Cardiology (ESC), American Heart Association (AHA). He is an author of over 100 publications including original papers, editorials, review articles and book chapters and is regularly invited to speak at both national and International conferences and act as a reviewer for a number of international medical journals. In 2017 he was awarded Fellowship of the European Society of Cardiology (FESC) and appointed Consultant Cardiologist between the Royal Berkshire Hospital, Reading and the Hammersmith Hospital, London and in 2018 appointed Honorary Senior Clinical Lecturer at Imperial College London. Neil is married with two boys. He enjoys playing sport (golf and football), attending the gym, reading and travelling. Consultant Cardiologist at the Royal Berkshire Hospital, Reading. Consultant Cardiologist at the Hammersmith Hospital, London. Honorary Senior Clinical Lecturer, Imperial College London. Percutaneous coronary intervention (PCI): including chronic total occlusion (CTO) PCI, coronary physiology assessment, intravascular imaging (IVUS/OCT), rotational atherectomy (rotablation), bifurcation stenting and left main stem intervention.